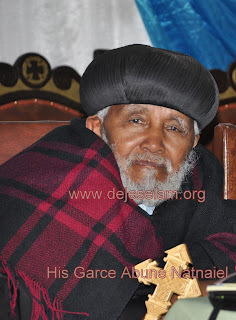 ከሚኖሩበት አገር አኳያ መልካም መልክት ነው በብፁዕ አባታችን የተላለፈው የአዲሱ ዘመን የመልካም ምኞት መግለጫ። ሆኖም ግን ''ለተቀማጭ ሰማዩ ቅርቡ ነው " እንደተባለው አይሁንብኝ እንጅ ፣ ብፁዕ አባታችን የታሰሩ የህሊና እስረኞች እንዲፈቱ ፥ መንግሥት ለብሔራዊ እርቅ እጁን እንዲዘረጋ እንደ አንድ የሃይማኖት አባት ብሔራዊት የሆነችውን ቤተ ክርስቲያን በመወከል በዚህ የአዲስ ዓመት የመልካም ምኞት መግለጫቸው ላይ አባታዊ ጥያቄ ማቅረብ ይጠበቅባቸው ነበር። በስደት ለሚኖሩት ወንድሞቻቸው አባቶቻችንም በተለየ መልኩ ለጦር ሠራዊቱ አባላት የተመኙትን መልካም ምኞት ቢጨምሩበት ኑሮ እንዴት የብዙዎቻችንን የውስጥ ስሜት በአወንታዊነት መልኩ መለወጥ እንደሚችል መገመት አያዳግትም ነበር። ያም ሆነ ይህ እኔም በዚህ አጋጣሚ ለደጀ-ሰላም ድረ-ገጽ አዛጋጆችና እንዲሁም ለደንበኞቻችሁና በውጭም ሆነ በውስጥ ለሚኖረው ለኢትዮጵያ ሕዝብ መልካም ዓዲስ አመት እንዲሆንልን መልካም ምኞቴን እገልጻለሁ። ..ኦ አምላከ አበዊነ ወአምላከ ዚአነ ! ግበር ዛቲ ዘመን ዘመነ ሰላም ወዘመነ ፍስሐ ፣ እስመ አንተ ውእቱ አምላከ ምሕረት ወሰላም። ዓሜን . Amen Abatachin. adisu amet lebetekristiyanachinim lehagerachinim melkam merin yemeyameta yihunilin! Excellent spiritual new year message! Long life for Father Nathenaiel and his colleagues! May God add more blessing on organizer of dejeselam, dejeselam fans, and all people of Ethiopia so that we can step up to the best level togather. Amen!!! Melekam Addis Amet lemelaw Ethiopiawyan bmulu yeberketna yeselam Amet Egziabeher yadereglen DengelMariyam bemelgawa tetbeqen!! Amen!